Osamu Obata was born in Yanai City in Yamaguchi Prefecture, Japan. He attended Senshu University, Tokyo, and graduated with a degree in Economics in 1971. In 1972, he moved to Canada along with his colleague and friend Kenji Ochi Sensei. Together, they joined the Japanese Canadian Cultural Centre where they became the senior instructors for the JCCC Aikido club. In 1973 he went to work for the Japanese Consulate in Toronto where he works as a consular officer today. 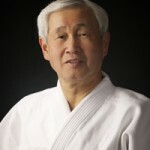 Obata Shihan began the study of Aikido in 1967 while studying at the university, under Shigeho Tanaka Shihan, of the Meiji Jingu Shiseikan Martial Arts Dojo in Tokyo. He earned his 1st degree black belt in 1968. He was drawn to Aikido because he appreciated its philosophical side, a martial art that originated from fighting techniques but stands for harmony and peaceful resolution of conflict. Obata Shihan believes Aikido acts as a bridge between cultures. Through regular practice students will develop more confidence. As they come to understand Aikido’s movements, they will move in harmony with each other. In 2003 Obata Shihan was awarded the rank of 7th Dan, and in 1993 received a long service award from the Government of Ontario for 15 years as a volunteer instructor at the Japanese Canadian Cultural Centre. In addition to Aikido, Obata Shihan also enjoys fishing, golf, Go (a kind of chess) and good sake.